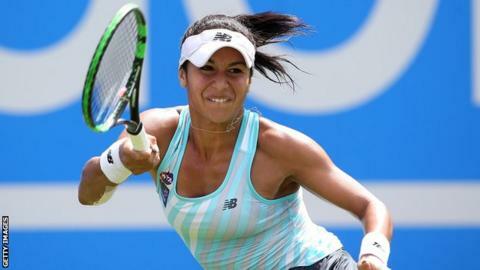 British number one Heather Watson lost in straight sets to Serbia's Aleksandra Krunic in the first round of the Aegon Classic in Birmingham. Krunic, a 22-year-old qualifier, beat the world number 45 7-6 (7-5) 6-4. Watson's compatriot Naomi Broady, 25, was also beaten in straight sets in her second round match with top seed and world number three Simona Halep, 23. The Romanian beat Broady, ranked 208 in the world, 6-4 6-2, with Johanna Konta now the only Briton still in the draw. Konta, a wildcard entrant at the tournament, reached the second round with a straight-set win over Australian Jarmila Gajdosova and faces Kristyna Pliskova of the Czech Republic on Wednesday. Watson was also knocked out in the first round at Birmingham last year, with Serb Ana Ivanovic going on to claim the title. The Guernsey-born 23-year-old was participating in the grass-court event as preparation for Wimbledon, which begins on 29 June. It was her first match since losing to American Sloane Stephens in the second round of the French Open in late May, having withdrawn from the Aegon Nottingham Open earlier in June. Watson has been struggling with an elbow injury, and said: "I'm still looking after it, still managing it, but I lost today because I just played really poorly. "I made way too many unforced errors and was very inconsistent. I just couldn't relax and find my rhythm. I just didn't feel comfortable. "I'm definitely going to Eastbourne and definitely going to Wimbledon."